Named after the Indians who lived there, Yosemite National Park is located four hours south east of San Francisco in the Sierra Nevada Mountains. The park draws four million visitors annually. The most impressive site is Yosemite Valley, carved by rivers of ice millions of years ago. 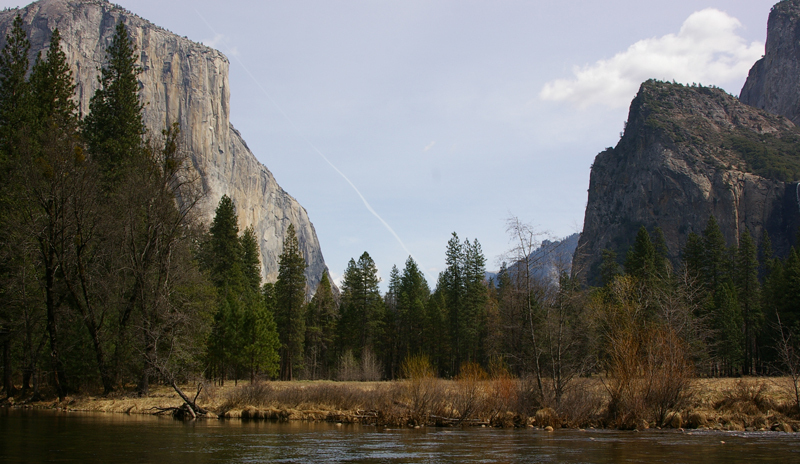 It’s seven miles long and about a mile wide and the crystal clear Merced River meanders peacefully through its meadows. It’s not only the first-time visitor who is awestruck by the granite walls that tower a 1,000 meters above the valley floor, which is itself 1,200 metres high. The most sublime feature of Yosemite is Half Dome, which rises in serene majesty from flowery groves and meadows. About 10,000 years ago, the last glaciers retreated, having sculpted the mountain into its current shape. Its peak, shaped like a bald eagle’s head, rises to 2,700 metres. A few climbers dare to climb its vertical face while most others do the easier climb over its rounded side. At the entrance to the valley, one encounters the brooding face of El Capitan. It too is a favourite of climbers but unlike Half Dome, the only option is a difficult and risky vertical climb. In between Half Dome and El Capitan are several other towering splendours such as the Sentinel Rock and the Cathedral Rocks. A major park attraction are its waterfalls, the most noteworthy of which are the 200- metre Bridalveil Falls, the three layered 750-meterYosemite Falls, one of the tallest in the globe, and the lush green 100-metre Vernal Falls. During a December visit, we drove past the Don Pedro Lake, a perfect blue lagoon nestled among rugged brown hills. This is a favourite spot for house boating in the summer. Fifteen minutes later, we were inside the park and got a glimpse of the life-enriching view of Half Dome. Snow from the prior week’s storm covered the dome, giving it an ethereal look. The highway was now travelling parallel to the Merced River. In a few miles, we were at the base of the Bridalveil Falls. In the summer, it is difficult to even find a place to park your car. When we arrived, there was hardly anyone there. There was of course a good reason for that. The temperature was around the freezing point as we got out of the car. The path was steep and made treacherous by patches of black ice. The spray coming off the base of the falls was intensely cold and we could only take it for a few minutes. We got back into the Jeep and drove toward Tunnel view, which provides a dramatic view of the valley that lies 300 metres underneath. We got there about a half hour before sunset and saw Half Dome turn into a gilded peak. Beyond it was the snow-covered peak of Clouds Rest, 3,000 meters high. We drove back to the valley floor as dusk settled in. The area around the Sentinel Bridge over the Merced River provides grand views of Half Dome and was, not surprisingly, hosting a photography class. Then we headed over to Yosemite Lodge to check in for the night. 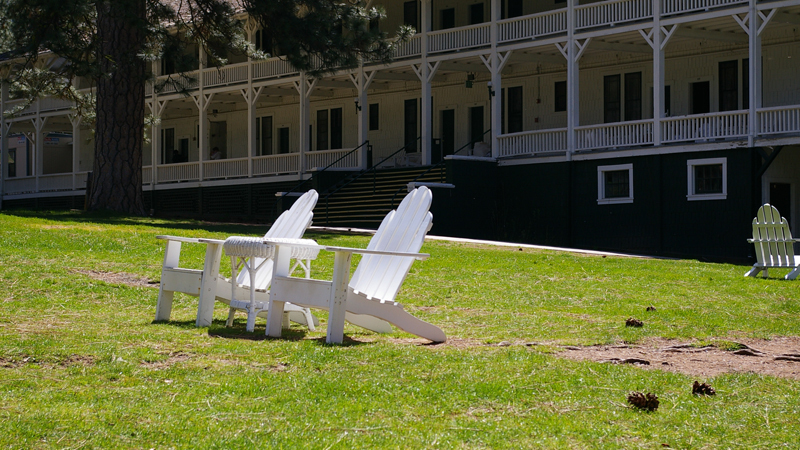 It’s located at an old campsite of the United States army’s Mariposa Battalion. At the reception desk, we were warned by graphical images not to leave food in our cars lest bears damage them. A smiling clerk told me that the bears in Yosemite did not hibernate in winter. We had trout with hot tea for dinner in the Lodge’s capacious restaurant. As we walked back to our rooms, the constellations lit up the night sky. Orion seemed incredibly close by, like the hunter had spotted his prey. Venus and Mars looked like two lovers longing for an embrace. I got up before sunrise to take a morning stroll only to discover broken glass next to someone’s brand new Jeep. I thought that it was the work of thieves but when I saw that the window frame was warped and its rubber lining ripped out, my thought turned to bears. And sure enough, there were paw marks on the windshield and the side view mirror had been thrown onto the ground. After breakfast, we hiked to the Yosemite Falls. At the base of the falls was a rainbow that gave this watery display of pure wilderness a jewel-like quality. Of course, the falls were a trickle compared to the thunderous display we had observed during our summer trips. On one such trip, we had hiked up the mist trail to the top of Vernal Falls. From the top, we had seen a stream of water 24 metres wide go tumbling down 100 metres, loudly draping the cliff with a wide ribbon of silky sheen. On many prior summers, we had driven to the top of Glacier Point and taken in the jaw-dropping view of the valley floor. From there, you can see climbers doing the hard trek up Half Dome. In one July, we had trekked over to Mirror Lake at the base of Half Dome only to find out that the way back required us to ford a stream that was icy cold even in the summer. During that trip, we had driven to the park late at night. Just a half hour before midnight, as I came across a bend in the road, the headlights of the Jeep lit up a crouching mountain lion sitting on the right side. He was probably waiting for deer and the jeep spooked him. All I got was one unforgettable glimpse of him as he stretched his golden forearms and leapt straight across the front of the jeep. In our April trip, we had driven to the park in a new two-seater. It had been a joy to see the gigantic granite walls and tall fir trees with the top down. Feeling the wind in our hair gave us our communion with nature. But in July, after the lion encounter, I was happy that I was a bit distant from nature in a tall, hardtop 4X4 vehicle. As we left the park, I was reminded of what John Muir, the explorer from Scotland, had written. The mountains on either side of the valley were “awful in stern, immovable majesty”, arranged so beautifully on a level floor that they made Yosemite look like “an immense hall or temple lighted from above”. Now I knew why the iconic photographer Ansel Adams wrote that he had discovered his destiny during his first visit to the park as a boy scout.